"Maybe it's sick, but I admit: I kind of like it, that feeling of suspension, that sense that something unknown - a force, a spirit - holds on to your heart, and won't let it beat, and won't let it go, at least for a little while" (89). After reading the very heavy Glimpse, I desperately needed a happy read. Everything about the cover of Alicia Bessette's debut novel, Simply From Scratch (available August 5), screams, "Light!" "Fun!" "Heartwarming!" I gladly picked it up ... only to find out the book's about a grieving widow. She's a quirky widow, though, and her story's more lighthearted than it seems at first glance. In fact, Simply From Scratch is a perfect blend of pensive and playful. I loved every page. Our heroine is 34-year-old Rose-Ellen "Zell" Carmichael Roy, a medical illustrator who's lived in small town Wippamunk, Massachusetts her whole life. With her freelance business just getting off the ground, she's pretty much got it all - a satisfying career, a loving marriage to her childhood sweetheart (happy-go-lucky photographer, Nick), the perfect pet (a retired Greyhound named Captain Ahab), a new house (okay, half a house), and plans to bear enough children to start her own soccer team (well, that one's mostly Nick's idea - she'll start with one and see how it goes). Then, Nick joins a relief mission to Katrina-ravaged New Orleans and everything changes. When he's killed in a freak accident, Zell's life plunges into a soul-shaking tailspin. More than a year later, Zell's still wandering around the house like a zombie, wearing Nick's camoflauge apron and talking like a pirate to her dog. Alone with the Memory Smacks that bring her husband back to her in painful glimpses, Zell struggles to stay anchored in the here and now. She knows she needs to move on, find closure, but she just can't. When Zell mistakenly receives her neighbor's cooking magazine in the mail, she spies an announcement that fills her with purpose for the first time since her husband's death. Cheery celebrity chef Polly Pinch (think Racheal Ray) is hosting her first annual Desserts That Warm the Soul baking contest. The winner receives $20,000, the exact amount Nick was trying to raise for Katrina victims. It's too big a coincidence to be anything other than fate. Zell decides to enter the contest, even though she hasn't touched her oven since, well, ever. Her first effort brings the fire department. And a pint-sized helper. Zell's neighbor, 9-year-old Ingrid Knox, is a Polly Pinch devotee who will do anything for a chance to meet her idol. Even help a baking-challenged widow. Convinced that she can help Zell win the contest, Ingrid throws herself into the project with customary zeal. Zell hardly knows what to do with the child, let alone her very good-looking (and available) father, Garrett, but she accepts the help anyway. It's a sacrifice she's willing to make in order to fulfill Nick's dream. As it turns out, Ingrid's not much of a baker, either. What she has in spades, though, is effusive happiness - the exact thing Zell needs to thaw her frozen heart. The more the pair bake together, the more successful their experiments become. With the help of several quirky townfolks, they come up with what just might be a winning recipe. As the project comes to an end, Zell realizes how much Ingrid's company has warmed her own soul. Zell's become so attached to the girl that she can't stand the thought of disappointing her, but that, Zell soon discovers, is exactly what's going to happen if she takes Ingrid to meet Polly Pinch. Breaking her promise will mean shattering the heart of the little girl who's been so instrumental in healing her own. Can she risk it? And what about her own heart - has it healed enough to give her the courage to face a future without Nick? Or will it shrivel back into itself without Polly Pinch to hold it together? Everything about this charming story - from the warm-hearted characters to the captivating setting to the hopeful tone - enchanted me. It's a little predictable, but, frankly, I couldn't care less. Curling up with Simply From Scratch is like spooning bites of rich, oven-warm brownie into your mouth while snow falls outside and a fire crackles in the hearth. The ultimate in cozy comfort. And you know I love me some cozy comfort. 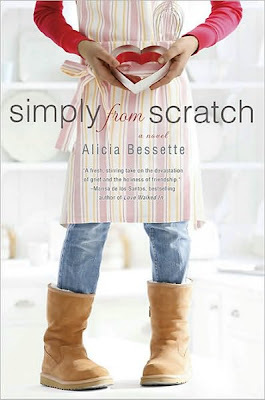 Easily one of my favorite books of the year, Simply From Scratch is, in a word, delicious. To the FTC, with love: I received a finished copy of Simply From Scratch from the generous folks at Dutton. Thank you! I've been anticipating this book's publish date. I noticed the cover first and think it is charming (however, why can we never see people's heads anymore?). Looking forward to it and glad that it suited you so well right now. Amanda - It's a really sweet book. Kay - I know - isn't the cover cute? I don't know what's up with the no-heads thing, either, but it's definitely trendy at the moment. I would love to read this!!! Any chance you are going to get rid of your copy?! It's That Time Again - Hop To It! It's 1 A.M. - Time to Hop!